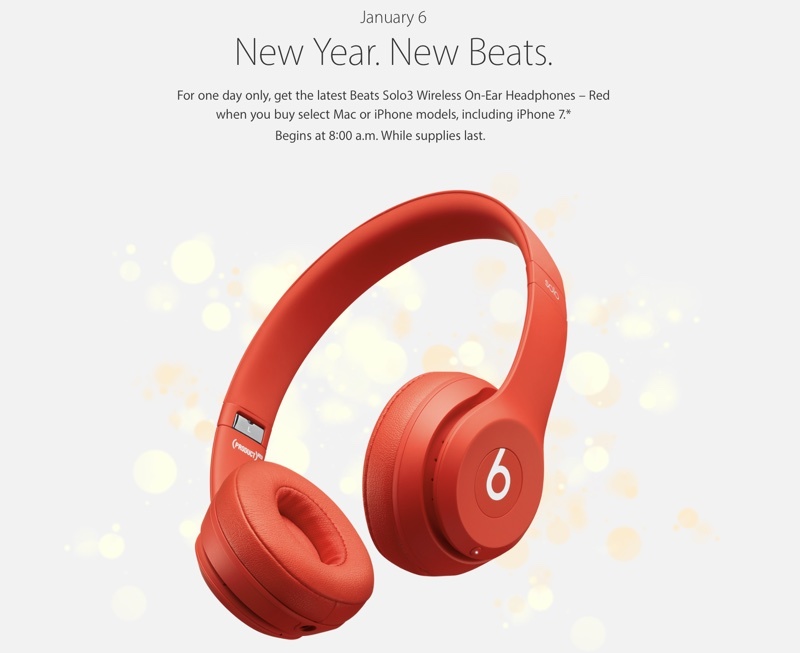 Apple today announced an upcoming one-day sale in celebration of Chinese New Year, where the company will provide free Beats Solo3 Wireless On-Ear Headphones in red to all customers who purchase a select Mac or iPhone in various countries around the world. The sale will kick off on January 6 at 8:00 a.m. local time and will be available in China, Hong Kong, Singapore, and Taiwan. A Chinese New Year announcement is available in Malaysia, but the country is not included in the free headphone offer. To get the free Beats headphones, customers in eligible countries will need to purchase an iMac, MacBook, MacBook Pro, MacBook Air, or Mac Pro, but the late 2016 MacBook Pro with a Touch Bar is excluded from the sale. Eligible iPhones include the iPhone 7, iPhone 7 Plus, iPhone 6s, and iPhone 6s Plus. 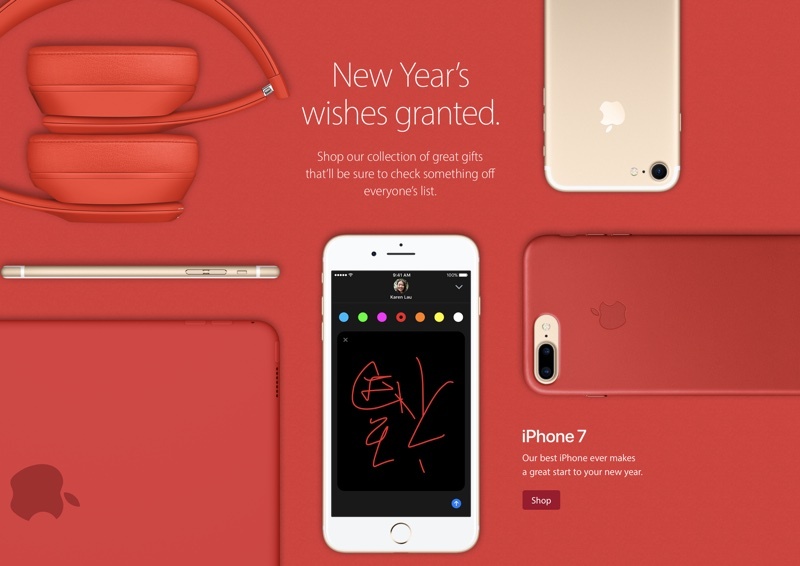 Apple's sale announcement is accompanied by a New Year's gift guide featuring a range of New Year's-themed products in red and gold, including a lion dance LionBot kit, a limited edition DJI Phantom 4 drone, and a Chinese New Year iPhone 7 case from Tech21. Last year, Apple celebrated Chinese New Year by introducing two exclusive Apple Watch Sport models featuring (PRODUCT)RED Sport Bands. Seems weird to me that they only do this for these select Asian countries. What about America their home turf? Nothing special at all? - We did just celebrate Christmas and our own new year. Beat headphones are awful and overpriced. * are sales that bad in those countries? It's clearly a strategic move to bolster iPhone presence in Asia, where Apple has faced tougher competition. Apple already strongly dominates profits and has a healthy chunk of marketshare in North America. They had Black Friday specials in the West, as well as free shipping over the holidays. Entitled much? Which deal entitled us to free headphones with our purchases? Don't wanna come off as a troll, but they couldn't pay me to wear those ugly, generically designed headphones that look like a blown up kid's set. Would much rather be wearing my AirPods, but still got till February for them to ship! If you guys want real sound with real bass in them, try V-MODA. Either Crossrade M-100 or the wireless version. Beats is just childish audio quality. Beats has the branding and name cache. There is nothing stopping Apple from continuing the improve the sound quality of headphones until it is comparable to other headphone brands. Which would probably cost less than trying to market that V-moda brand until it has the same degree of brand recognition of Beats.